We proceed slowly and purposefully. 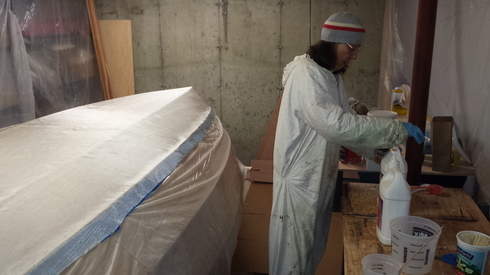 We received the box-o-boat right after New Year's Day and started putting her together a few days later on 6 January 2016. Today is the 26th of February so some 50 days of calendar and 19 days of pushing the project forward. Today was for installing the breast hooks. The epoxy has to set up for a day or so in our cool basement and then we'll install the rails. Tomorrow, we'll get the clamps needed for that task while the epoxy cures. Elizabeth cleans up some runs with a rag and alcohol. The entire operation only took a few hours from start to finish with most of the time spent in fitting the parts, drilling the screw holes, checking the screwed in fit before epoxying. One mistake but no one will ever find it. Lest we forget the deep water boat, Averisera. Love that deep keel. 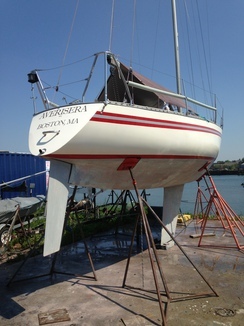 The picture is from our Boston days and she is about to get a coat of bottom paint before launching and delivery to Cape Cod. The notoriously shallow water of the Cape limits our use of Averisera. 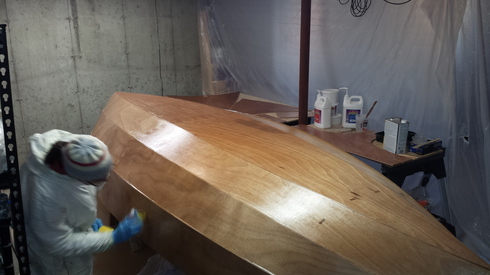 First coat of epoxy has been applied to the bare wood on strakes two and three. The fiberglassed area got a second coat. Below, E touches up a spot. THe Okume wood is very attractive and certainly encourages a varnish finish. 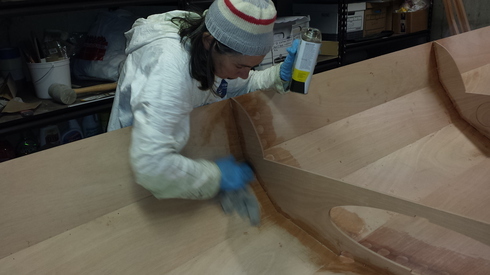 We will paint the hull inside and out leaving the seating varnished. Or, that's the plan. Lots of puttering, lost track of the days. 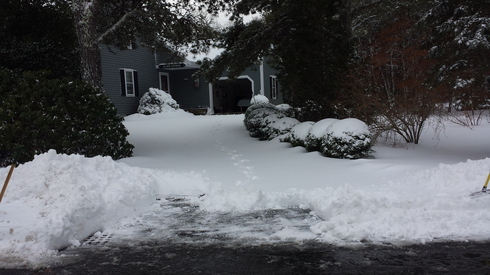 Some of those days involved snow, lots of snow, and sub zero temperatures. Distractions. 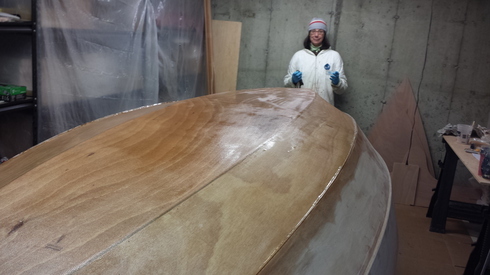 The big news is the fiberglass protective layer has been epoxied in place. It was easier than we expected. 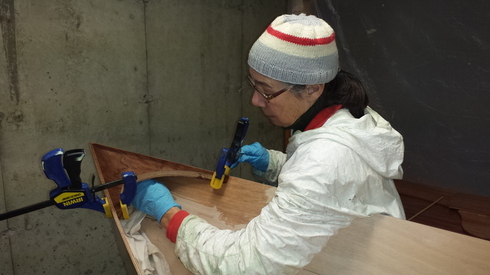 The bare wood was prepared by light sanding, vacuuming, wiping with alcohol and installing a drip skirt. The drip skirt is covering strakes two and three. The fiberglass is covering the bottom and strake one. The glass fiber cloth lay down without a wrinkle. Surprised Norm, Elizabeth... not so much. Before the epoxy is soaked into the dry glass next. 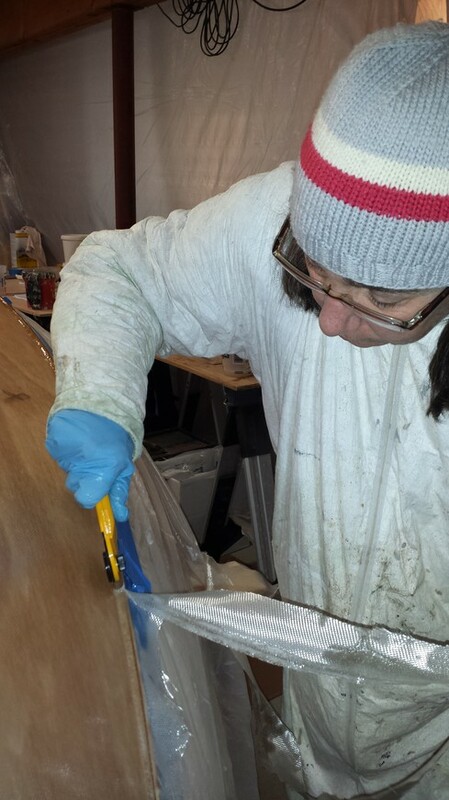 Elizabeth is mixing epoxy. We poured the thick fluid on and squeegeed in into the fabric. The cloth had to be trimmed to just lay in the first strake/second strake joint. Elizabeth has a fabric cutting tool from Sweden that made the job easy. It is an OLFA Rotary Cutter. The finished product, skirt removed and tools about to be cleaned. 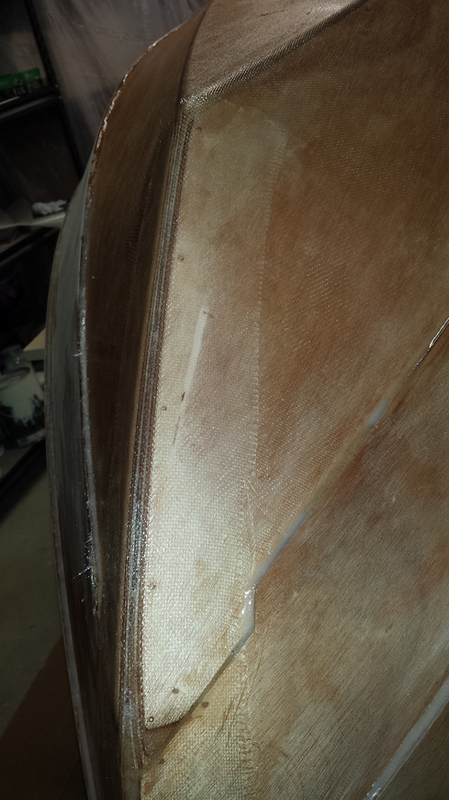 One more thing... the stern and bow stems were fiberglassed from sheerline to bottom. 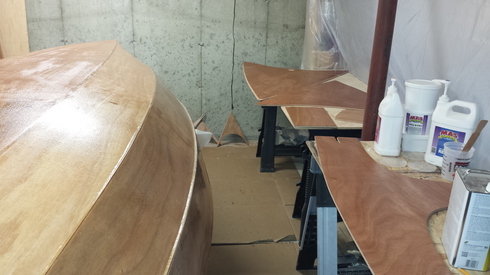 The inside and outside are now firmly bonded together with fiberglass in epoxy, strong stuff. Norm has an idea that the front view needs sprucing up. It has a charmingly rural look right now. Across the street, our neighbor has a manicured lawn that maybe looks better. I appreciate the work he does every time I look that way and we often do. I am thinking something not too manicured, rustic charm maybe? Here is the starting point in pictures. 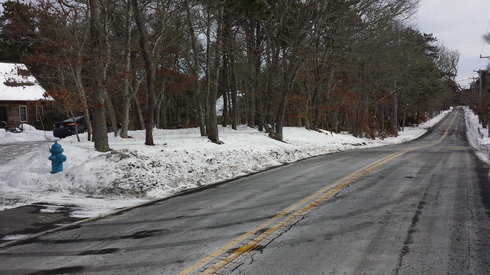 Before and after the snow storm. February offers good sunlight for growing. I think? 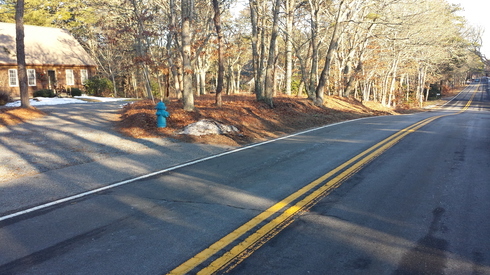 Some of the trees should be pruned or removed to reduce the risk of falling and blocking the road after a storm. Not a bad morning's work for a couple of 65 year olds! A good workout in just a few hours. Huckleberry: Before. 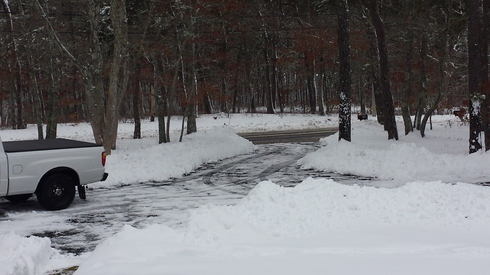 Snow 8-9 inches in most of the driveway. Huckleberry: Pretty scene across snow covered lawn. 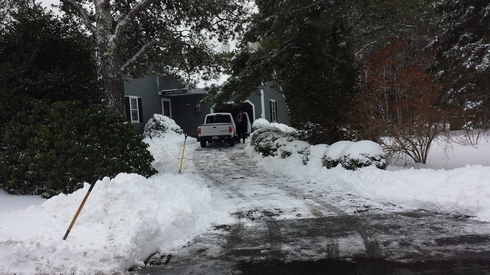 Main Street house: Cleared by hand, too thin a layer of snow under the overhanging trees for the John Deere 826 blower, The Beast. The project advances! 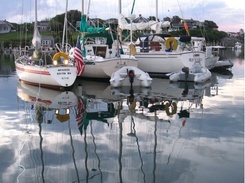 The conversation is turning to things like hull color and where to sail. Above: The stem is glassed in place with a strip of fiberglass cloth and epoxy resin. The frame, or bulkhead, shows the copper wires yet to be removed. The frames are tacked in place at this point so the boat is pretty much glued together and about as stiff as it is going to get. Norm has 'laid up" lots of glass cloth over the years. It was the first round for Elizabeth. We did the bow and stern stems. Working with epoxy is much better than the old days of polyester resin. The stems were our practice run for the big job of glassing the bottom. So far so good. No arguments. The build process is fun. The frames are tacked in position with a mixture of resin and filler until we remove the copper wire and then lay in a bead of epoxy resin strengthened with wood dust and silica powder. Mama is using alcohol on a rag to clean up spills and runs. This epoxy doesn't call for acetone, which is another big plus! We are working with materials that are friendly. End of Day 13. All the seams are filleted with epoxy with silica and wood dust mixed to the consistency of "peanut butter." We just call it peanut butter. 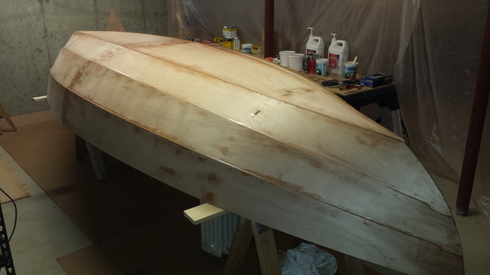 The boat is ready for sanding which we will do outdoors on a dry day. The next step here is to lay on fiberglass cloth and saturate with epoxy resin. 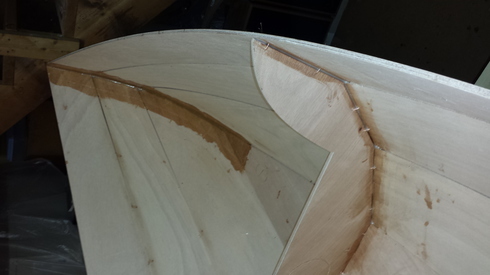 The glass will cover the bottom and first strake, sealing the garboard seam. I had to make a run to the hardware store this afternoon and met a guy who has a house in the BVI. We talked about the tropics and the BVI. 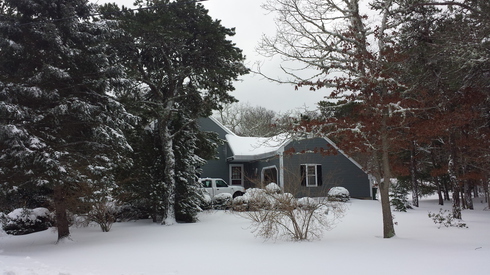 He said boat building on Cape Cod during the winter seemed like a good way to spend time. He's dodging tourists from three cruise ships a day on Tortola. That's about 10,000 new tourists every day. Sort of puts things in perspective.